A high-tech investigation confirmed the use of neurotoxins in the Syrian chemical attacks. A man mourns over a dead body after a poison gas attack in Damascus, Syria in August. Scientific advancements rarely become the crux of diplomacy. But in September, labs working with the United Nations used faster and more sophisticated analytic techniques to show that Syrian civilians were killed by the chemical weapon sarin on Aug. 21 — evidence crucial to debates about whether the global community should intervene. U.N. inspectors were not able to visit the attack sites in Damascus until five to eight days after rockets struck. In the past, this delay could have made the poison difficult to detect. But today’s mass spectrometers, which determine the molecular makeup of a sample by exactly measuring the mass of its components, are roughly 1,000 times as sensitive as those used in 1995, when sarin was released in a Tokyo subway, says Maarten Nieuwenhuizen, a senior chemical, biological, radiological and nuclear protection consultant at TNO laboratories in the Netherlands. Although the U.N. report offers few details, Nieuwenhuizen says the devices likely pinpointed molecules that formed when neurotoxins react with blood proteins — a signature that can persist in the blood up to 90 days. The analysis played a role in garnering a Nobel Peace Prize for the Organisation for the Prohibition of Chemical Weapons. A court in Bahrain has sentenced 12 anti-regime protesters to prison for allegedly attacking a car warehouse as the Al Khalifa regime steps up its crackdown on dissent. On Wednesday, the court sentenced the protesters to 15 years in jail each, accusing them of setting the car warehouse ablaze near the capital Manama where 59 cars were damaged in February 2012. The Bahraini court slapped a total of 383,000 dinars (USD 1 million, 700,000 euros) in fines on the group for the cars damaged in the warehouse. On December 8, a court in Bahrain sentenced 12 anti-regime protesters, including three minors, to prison terms of up to five years. The court sentenced the nine adults to five years in jail each. The three minors were also given three-year prison terms each. My head feels like it will explode. There are many urgent questions but, like most Palestinians, I feel a sense of incomprehension as I listen to the news about John Kerry’srecurring visits, and the talk of a Palestinian state and lasting peace. More time is tantamount to more construction of colonies; the number of colonies that were constructed since Oslo has doubled, bringing the number of Israeli settlers in the occupiedWest Bank — including East Jerusalem — to as many as 650,000, according to some figures. RAMALLAH (Ma’an) — Family visits for Palestinian detainees in Israel’s Megiddo jail were canceled on Wednesday after clashes broke out between prisoners and Israeli prison guards. Relatives of prisoners told Ma’an that their visits were canceled due to the clashes, with witnesses saying that Israeli guards fired tear gas into prison courtyards. Israeli media reported that detainees began throwing objects at guards and set a laundry room on fire in protest against the transfer of two inmates from a wing of the jail. Three detainees were injured during the clashes. Palestinian detainee Arafat Jaradat died in Megiddo jail in February after being allegedly tortured during an interrogation by Israeli forces. There are around 5,000 Palestinian detainees in Israeli jails. The transfer of detainees to jails within an occupying power’s territory is illegal under international law. RAMALLAH (Ma’an) — Palestinians in administrative detention in Israeli jails will hold a hunger strike on Thursday in protest of their detention, the minister of prisoners affairs said. Issa Qaraqe said that detainees will continue their protest steps despite the arbitrary punishments imposed on them by the Israeli prison administration. Over 300 Palestinians are held without charge in administrative detention in Israeli prisons, using laws dating back to the British Mandate period. Yemeni military personnel visit the scene of the attack on the Yemeni defence ministry that took place on December 5. A warning of a possible attack in the part of Yemen’s capital where U.N. offices are located has prompted an order for staff to stay home on Thursday, a U.N. source said. “Staff of the U.N. mission and U.N. agencies have received instructions not to turn up for work on Thursday,” the source said. The source said it was a “precautionary measure following advice from Yemeni security authorities”. The guidance warned of the “risk of possible acts of terrorism in certain places, particular Hida,” the south Sanaa neighborhood where the U.N. offices are located, the source said. A government spokesman told AFP that Western embassies were not affected by the alert. “Additional security measures will be taken around certain key installations and foreign interests, including the offices of (French energy giant) Total,” the spokesman said. However, he added that the American School, in a northwestern suburb of Sanaa, will close on Thursday. Security forces have been on high alert in the city since a brazen daylight attack on the defense ministry’s sprawling headquarters on December 5 killed 56 people, among them expatriate medical staff. 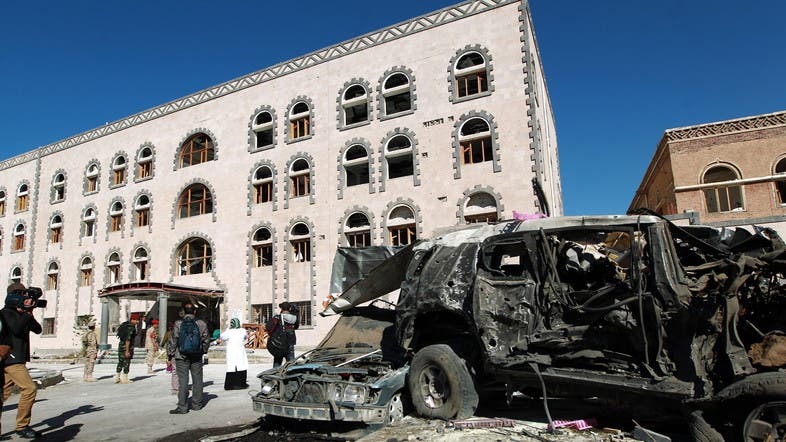 Information gleaned during the investigation into that attack, which was claimed by al-Qaeda, led to the discovery of two cars packed with explosives and a massive search for five more suspected to be still inside Sanaa. In August, a security alert prompted an unprecedented closure of American embassies across and beyond the Middle East, which was mirrored by the British and French missions in Sanaa. 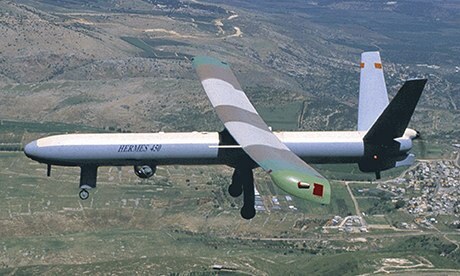 An Elbit Systems Hermes 450 drone. A campaigning charity has criticised the UK’s deal with an Israeli firm to develop a new drone, Watchkeeper, which the charity claims has been “field tested” in attacks on Gaza that left many Palestinians dead. War on Want, an anti-poverty charity that also campaigns for justice for Palestine, called for an embargo by the European Union on arms trade with Israel, a move that would end collaboration between Thales UK and Israel’s Elbit Systems, one of the world’s leading manufacturers of unmanned aircraft. The Ministry of Defence has awarded a succession of contracts for the long-delayed Watchkeeper project, now totalling nearly £1bn, to a joint venture between Elbit and Thales UK to build 54 drones. After a series of technical problems, Watchkeeper finally received its “statement of type design assurance” in October from the Military Aviation Authority, giving the MoD the green light for airworthiness and safety tests. The joint venture, UAV Tactical Systems, will oversee the Watchkeeper programme with work subcontracted to a number of other British companies. The design and technology of Watchkeeper is based on Elbit’s Hermes 450 model, which Israel has used extensively over Gaza. British forces have used unarmed Hermes drones in Afghanistan. In a 23-page report (pdf) published on Wednesday, War on Want refers to reports of armed Israeli UAVs killing Palestinians in Gaza. About 800 Palestinians have been reported killed in Israeli raids by drones between 2006 and 2011, the charity claims, citing the Palestinian Centre for Human Rights. However, it is not known whether the strikes were by Elbit drones or by other Israeli unmanned weapons systems or aircraft. The charity’s report also says the previous Labour government rejected Israeli assurances that UK arms would not be deployed against civilians in Palestinian territory, but there were now 381 extant British arms licences to Israel, worth £7.8bn. Elbit Systems said it had no comment to make. This week the Guardian reported that new guidance published by UK Trade and Investment, which promotes British businesses in foreign markets, stated there were “clear risks” related to economic and financial activities in West Bank settlements, and it did not encourage or offer support to such activity. 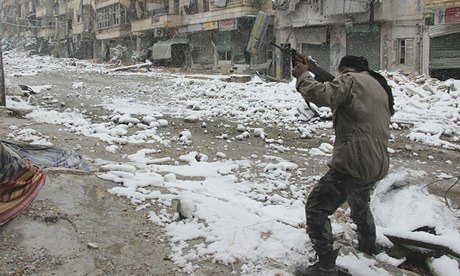 A Syrian rebel fighter aims his weapon at pro-government forces in Aleppo. The US and Britain have suspended all non-lethal aid to Syrian rebels after Islamist fighters seized control of headquarters and stores belonging to western-backed opposition forces. The sudden decision highlights the hazards of backing rebels fighting the regime of Bashar al-Assad at a time when extremist groups are in the ascendant. The US embassy in Ankara said on Wednesday it had suspended “all non-lethal assistance” into northern Syria after members of the newly formed Islamic Front took over premises belonging to the Free Syrian Army’s Supreme Military Council, which is aligned to the anti-Assad opposition National Coalition. Louay Meqdad, a spokesman for the FSA, urged “our friends” to reconsider the decision. Washington and London have supplied communications equipment, vehicles, body armour, medical supplies, cash and food to rebels fighting under the authority of the FSA. Arms are generally paid for and supplied by the Gulf states. The Islamic Front, which comprises six rebel brigades, seized warehouses reportedly containing dozens of anti-aircraft weapons and anti-tank rockets at the Bab al-Hawa crossing on the Turkish border last weekend. The group is backed by Saudi Arabia. The US said there had been no change in its policy of providing non-lethal support to the moderate opposition. In the House of Commons, David Cameron warned against the idea that the entire Syrian opposition was extremist and stressed the need to continue working with its moderate members. He said Britain should remain “fully engaged” in all efforts to end the civil war. “We must not allow this argument to develop that the only opposition in Syria is an extremist opposition,” he said. The opposition is under heavy pressure to attend a peace conference on Syria in Geneva in the third week of January. Divisions in the rebel camp have weakened their efforts to bring down Assad. The conflict began with peaceful protests in Deraa in March 2011 and has descended into outright civil war that is estimated to have killed more than 126,000 people from both sides. Wednesday’s announcements do not affect humanitarian support because that is distributed through aid groups and the United Nations. The first UN relief airlift to Syria from neighbouring Iraq will deliver food and winter supplies to the mostly Kurdish north-east over the next 10 days. Thirteen international news organisations including the Guardian have written to Syrian rebel groups urging them to desist from kidnapping journalists and asking for the release of an estimated 30 who are believed to be held hostage. Addressed to “the leadership of the armed opposition in Syria,” the letteris signed by news agencies, leading US newspapers, the BBC, the Daily Telegraph and the Economist. It is being emailed to the FSA and sent via social media to the leaders of other groups including the Islamic Front. It was revealed on Tuesday that two Spanish journalists – Javier Espinosa, an El Mundo reporter, and Ricardo Garcia Vilanova, a freelance photographer – are being held in Syria. They are thought to be in the hands of the Islamic State in Iraq and Syria in north-eastern Raqqa province. Another group with links to al-Qaida, Jabhat al-Nusra, has abducted other journalists. [Wednesday December 11, 2013] Israeli sources have reported that the army kidnapped two Palestinians who crossed the “border fence” between the Gaza Strip and Israel. The sources said that the two were unarmed, and likely tried to enter Israeli searching for work. The two have been moved to an interrogation facility in an Israeli settlement close to the border with the besieged and impoverished Gaza Strip. There have been dozens of similar incidents as the Gaza Strip remains under strict Israeli siege, despite Israeli claims of easing it, and allowing a limited number of trucks carrying urgently needed supplies into the coastal region. It is worth mentioning that dozens of Palestinians have been killed or wounded, and dozens have been kidnapped, for approaching the border fence area, while most of them were working in Palestinian lands close to the border, and did not even come near the fence. Israeli considers Palestinians lands close to the border fence to be a “no-man zone”, and anyone who enters it is subject to direct army fire without a warning.